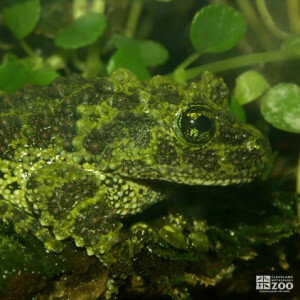 The Vietnamese Mossy Frogs range is Northern Vietnam, possibly China. Vietnamese Mossy Frogs live in steep, rocky limestone cliffs in evergreen rainforest. Vietnamese Mossy Frog eggs hatch in 7 to 14 days. If threatened, Vietnamese Mossy Frogs will curl up into a ball to disguise the fact that it its edible. Vietnamese Mossy Frog eggs are deposited above the water to protect the eggs from water dwelling predators. When the eggs hatch the tadpoles will drop into the water below.